There is toxic material all around us. Some of it breaks down into non hazardous substances, while other can accumulate and build up in a food chain. Mercury can be extremely dangerous. When it builds up in the ecosystem, it can cause nervous and reproductive damage to mammals. So how does it build up? Lets say one plankton absorbs 1 gram of mercury. 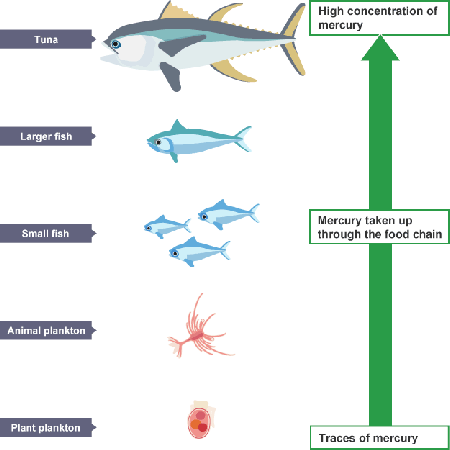 One fish eats 5 plankton, meaning the fish now has 5 grams of mercury in it. 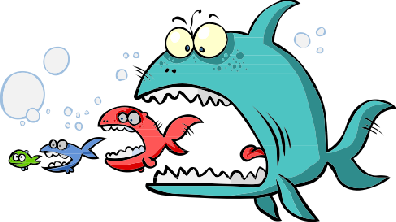 In turn that fish is eaten by a bigger fish, along with 5 of his friends who also ate plankton. The big fish now has 52 grams of mercury in it. Finally we eat a 5 big fish. Meaning we now have 260 grams of mercury in us. 3. Explain the term Bio accumulation, and explain how top predators are at risk.